Florida Georgia Line are currently out on the road on their massive North American headlining concert tour. Kicking off back in May, the Dig Your Roots Tour will continue hitting amphitheaters and arenas across the USA and Canada, in cities including Des Moines, Nashville, and Atlanta, before wrapping up in mid-November. 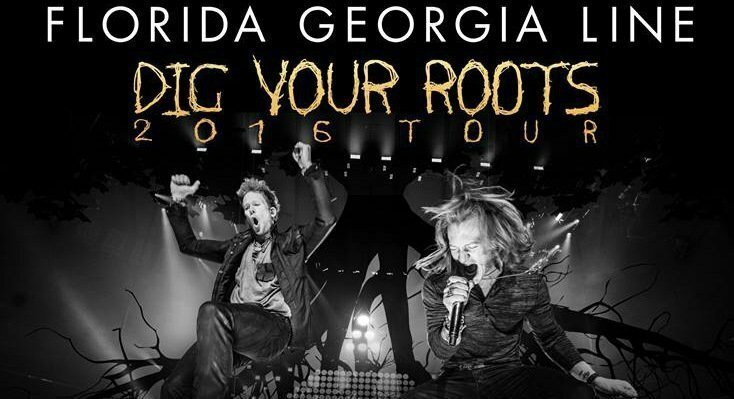 Tickets to see Florida Georgia Line out on the Dig Your Roots Tour are currently on sale now. With the final portions of their route scheduled to take off, tickets to see Florida Georgia Line in the upcoming months remain in high demand and are continuing to steadily rise across the secondary market. According to the data provided by TiqIQ, tickets are currently averaging $145. Florida Georgia Line is scheduled to make stops in cities such as, Charlotte, North Carolina on September 10 at the PNC Music Pavilion, where tickets are averaging $147, and the cheapest ticket is available for $65. On October 7, they will appear at the A-K Chin Pavilion in Phoenix, Arizona, where tickets here are averaging $161 and the lowest get-in price can be found at $43. They will then head to Kansas City, Missouri where they will perform at the Sprint Center on October 15. Tickets for this stop are currently averaging $123, with the lowest get-in rate clocking in at $47. Florida Georgia Line will wrap up in the States with two shows in Washington on November 10 and 11. First, on November 10, they will hit the Spokane Arena, where tickets are currently averaging $126, with the cheapest ticket available for $54. On November 11 they will appear at the Tacoma Dome, where tickets are averaging $110, and the lowest get-in rate is $54.